Thought Google Glass cost a pretty penny? 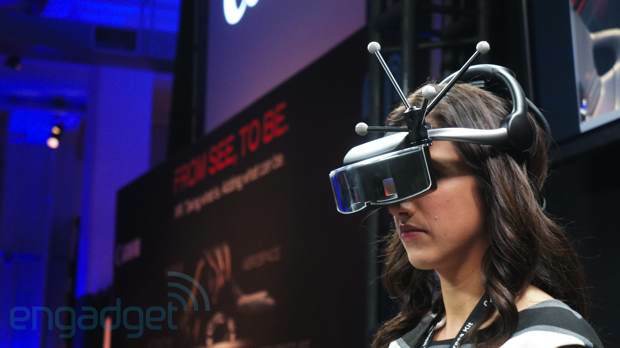 Well, try this head-mounted display on for size. It's that Mixed Reality wearable from Canon that we've been hearing so much about. As previously noted, it's set to hit the States the first of next month, carrying a decidedly gigantic $125,000 price tag (plus an estimated $25,000 in annual maintenance). But before you go writing a brashly worded letter to the bigwigs at Canon, remember: this isn't really for you. That is, unless you're an automotive manufacturer, research university or museum display curator. This is a heavy-duty, industry-facing device. That said, the camera maker did give a few of us non-industry folks the chance to play around with the display at an event in Manhattan last night, while the rest of the tech world was fawning over that fancy new PlayStation thingamabob. Having spent some time with Sony's HMZ-T1, we've got to say that the experience of wearing this far, far more high-end product wasn't all that different from a hardware perspective: slip it over your head, place it on the bridge of your nose and tighten. It's possible to get it snug without being too uncomfortable -- and when it's time to take it off, a flip of the lever will remove it in one go. As with Sony's portable HDTV offering, the MREAL has two small displays sitting just in front of your eyes -- and also like the Sony (and any similar technology, we'd imagine) certain images take some getting used to -- particular those intended to be up close, with small writing (the dashboard of a car, for example). Other, broader images, on the other hand, are immediately clear (e.g., a big flower bowl a foot away or a dinosaur down by your feet). There was also no light-blocking on the devices we demoed, so there's a lot of interference coming from the sides. This is probably not a huge deal for manufacturers, but immersive interactions like museum displays could do with a small curtain. Also slightly cumbersome is the cable that trails the headset like a tail -- any demo that involved walking around required having an employee lift the cables and walk around as if you were wearing some Victorian bridal gown. Canon and a handful of partners were on-hand at the event, showing off demos that utilized various sensors, including the gyroscopes and magnetic / optical sensors. Some of the more advanced ones required big add-ons that didn't add much to the weight (which, for the relatively short period we spent wearing the device, wasn't especially cumbersome). But they certainly added a touch of character to the device. In one demo, a box decorated in QR-like codes opens to reveal a bouquet of virtual flowers. Touching them changes their color, as a bee buzzes around. You can open and close the box and move it around, and the graphics match up extremely well -- the cameras only need to catch a couple of codes to generate the image. In another demo, the wearer is seated in a leather car seat, as the device constructs a car around him or her. The interior is quite vivid -- it's hard to temporarily suspend one's reality long enough to really feels as though you are inside an actual car -- but, at least in the case of this demo, that's not really the point. Rather, the idea is to get some semblance of what it might be like sitting inside a car you've digitally prototyped. Look around and you can see details on speedometers. Look out the window and you see the real world -- click a button on your iPad app and you can open the sunroof to see more of the same. With the app you can also open the doors and change colors on the fly, in case that traffic cone orange wasn't doing it for you. Most impressive was the museum demo, in which a wall and table covered in codes becomes a Jurassic landscape. 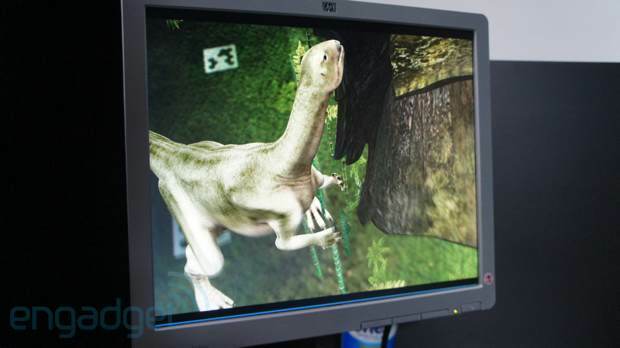 A small dinosaur wanders around your feet, while a giant predator lumbers off in the distance -- it's a little easier to suspend one's disbelief here, but again, this isn't a full-scale virtual reality device. Sadly, in the car and dinosaur demos, there's no real interacting with the scenery -- and in the former, wearers are required to put on brightly colored dishwashing gloves if they want to see their hands. It's easy to see how the MREAL could prove to be a powerful tool for digital prototyping -- though that $125k price tag seems a hard one to justify if you're not, say, Boeing. It's also exciting to imagine just how such a tool might be utilized in a museum-like setting, and hopefully developers will take advantage of that SDK to develop some truly exciting applications for the technology.